In my previous post I described growing popularity in Poland of mobile payments and various initiatives, as IKO, challenging credit cards companies. The highest credit card transaction costs in Europe made mobile payments a very attractive option for both consumers and retailers. While Poles are going to take advantage from much lower , closer to the EU standards, interchange fees the tourists need to be aware of quite common practices of offering Euro payments, instead of Zloty, while using credit/bank cards. The offered Euro payment option comes across as something you at least understand and can trust. However it can be very expensive. 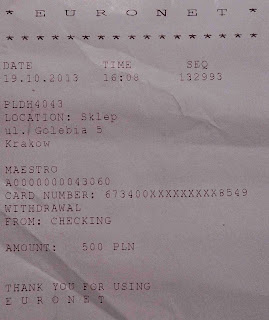 How expensive I tried to figure out myself while using Euronet ATM machine in Krakow on 19th October 2013. 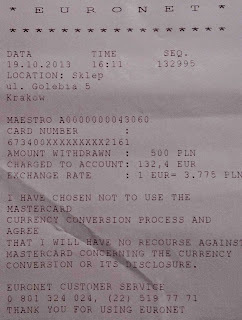 While withdrawing 500 Polish Zloty I was offered Euro exchange rate option. I neglected that option as I found the offered exchange rate too low. 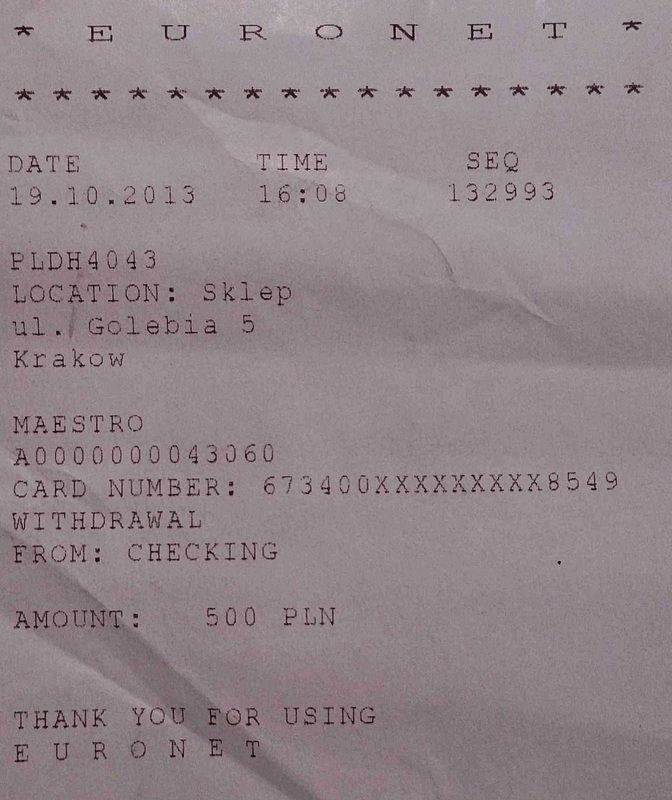 A few minutes later, however, I did decide to use the offered exchange rate, as you can see in the attached receipt, 1 Euro = 3.775 Zloty (PLN), to find out how bad the offered exchange rate was. 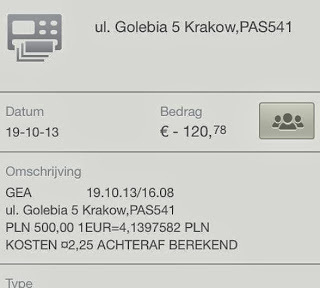 Not choosing the Euro option was very beneficial for me: my bank ABN AMRO applied an exchange rate 4.1397 zl for 1 Euro and I only paid 120,78 Euro (including 2.75 Euro transaction costs) for 500 Zloty instead of the 132,4 Euro charged by Euronet. 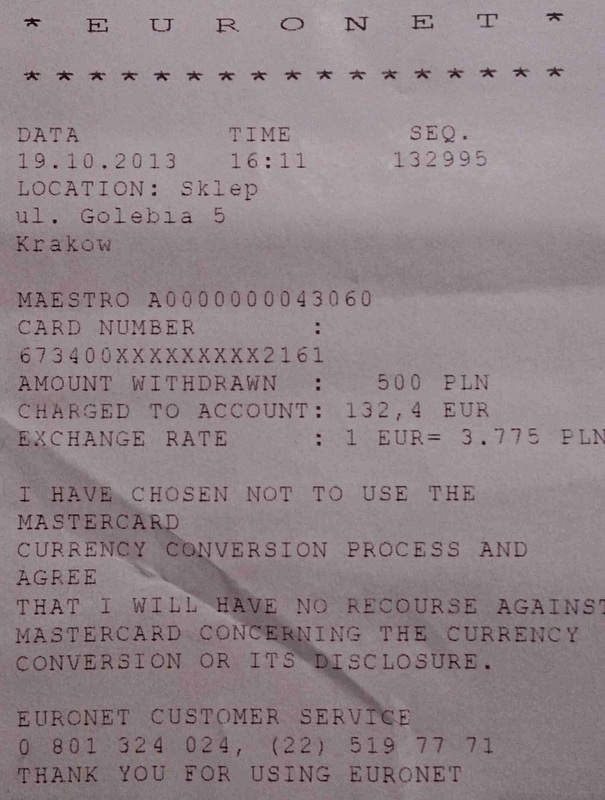 According to ECB the official exchange rate that day was 1 Euro = 4.1808 Zloty. Using Euronet exchange rate you pay 10% more for Zloty than you should using the official exchange rate. What at first glance came across as an advantage appeared to be a very expensive option. "I have chosen not to use the Mastercard currency conversion process and agree that I will have no recourse agains Mastercard concerning the currency conversion or its disclosure"